It finally happened. I guess I shouldn't be surprised, nearly doubling my weekly mileage is way above the 10% rule that everybody touts. I suffered my first injury of this training cycle. I got myself a shin splint. I've battled shin splints for year. When I was training for my first half marathon, the farthest that I ran was six miles and I had shin splints that were so painful I could barely walk. Since then, shin splints have been my excuse for not regularly running. It wasn't until I re-jiggered my stride a few years ago to increase my cadence that I was finally able to train without fear of injury. But alas, after one of my tempo runs I was sore. I hoped I could ignore it and that it was just temporary so I ran my easy run the next day and the soreness only go worse. So I decided to take some time off from running. 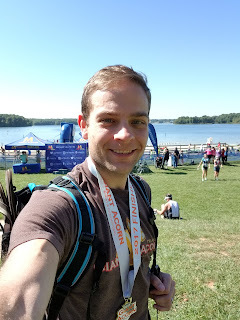 I planned on hopping on the bike as a way of losing as little fitness as possible, but I managed to catch a nasty 24 hour bug that prevented me from doing even that. I actually caught the bug from my daughter who was sick for the first time in her life. That was not a fun time, but she handled it like a trooper (much better than her parents, that's for sure!). 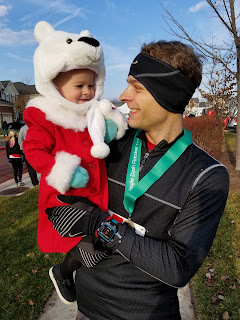 I was worried about the injury and sickness coming in at the peak part of my training plan and how that would impact my race performance next week. Yesterday was my last non-easy run (10 mile tempo at 6:52/mile) and I felt good on it. I have no clue if I'll be able to hit my goal for the marathon, but it's nice to know that taking a week off from running didn't completely derail my fitness. I know that's a silly thing to think, but the way that I psyched myself up to keep up with the training plan was to convince myself that every workout matters. That mindset really helped me keep to my plan. One week to go. I've started looking at the weather and there's a chance for rain, though the temperature looks like it's going to be right. I can't imagine running 26.2 in the rain, but I'll make it work if it does!